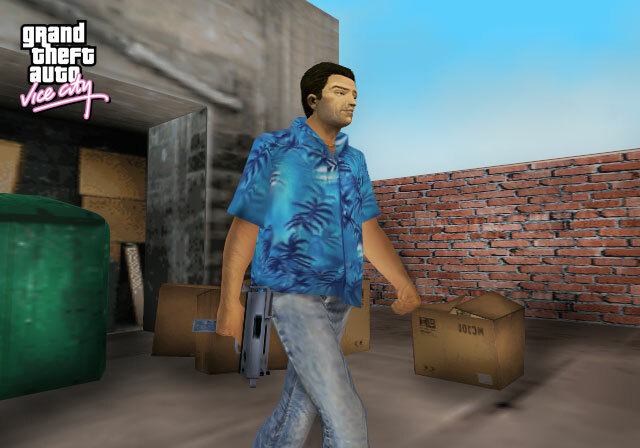 Tommy Vercetti wielding the MAC-10 in a pre-release screenshot of Grand Theft Auto: Vice City. This is a screenshot of a weapon from Grand Theft Auto: Vice City - a copyrighted video game developed and published by Rockstar Games. On Grand Theft Wiki, it is believed that the use of web-resolution screenshots, for identification and critical commentary on the game in question or the copyrighted characters or items depicted on the screenshot, qualifies as fair use under Copyright law, as such display does not significantly impede the right of the copyright holder to sell the copyrighted material, is not being used to generate profit in this context, and presents ideas that cannot be exhibited otherwise. See Grand Theft Wiki:Copyright for more detail on our copyright policy. current 03:23, 20 January 2012 640 × 448 (57 KB) MrLanceVanceDance (talk | contribs) Tommy Vercetti wielding the Mac-10 in GTA Vice City. This page was last modified on 12 September 2013, at 21:49.